What a fun time at Crafter Quarters, Amesbury, MA, late January! While the snow was flying in their part of the country, they were warm and cozy learning to use their Featherweight's sewing attachments. Sure wish I could have been there! Ann Lamb and her husband know all about the lovely Featherweight, helping many keep their precious machines up and running! Several machines were even given a nice sprucing up with oil and cushions. Thanks to both of you our vintage featherweights can give us, and our grandchildren, many more years of sewing. Ann coordinated this fabulous play day, Playing With Your Parts, and those attending not only learned how to use some fabulous attachments, but gained an appreciation for former seamstresses that only had these parts to embellish (not all the built-in stitch patterns of today). Aren't they just fabulous sewing tools to use? I am always in awe of such wonderful inventions! 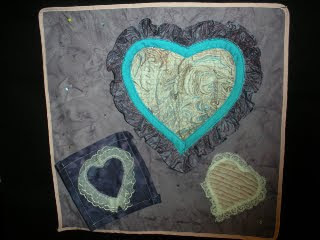 Ann shares her Valentine Wall hanging. Her largest heart was shirred using the gatherer, the pink heart was pin tucked with the tucker. A gorgeous ruffle surrounds the large heart. Can you see the tiny hem on the ruffle the hemmer foot made? Not an easy feat and takes practice. The dark purple heart was ruffled using a different setting on her ruffler, and the adjustable hemmer to hem it. The edge stitcher added the lace very nicely, and the lovely pink bias tape was put on with the binder. Her regular presser foot sewed all to the large background. Ann, this is a very beautiful wall hanging! Thank you sew much for sharing your wall hanging and the fantastic time had by all! The sewing machine attachments turn our vintage straight stitch sewing machines a large variety of embellishments. Each does take practice learning to use, yet the satisfaction is well worth it.